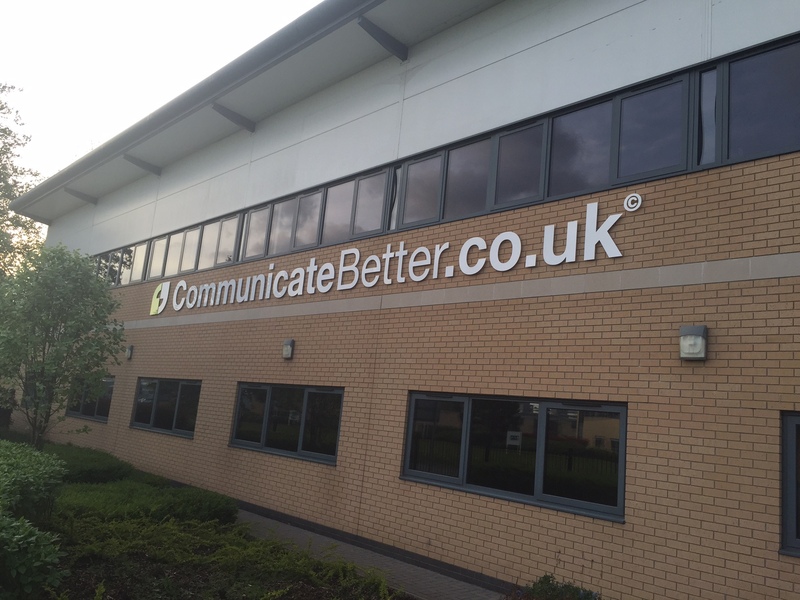 Communicate Better is a Unified Communications Provider based in Warrington. We have worked with them over recent years to develop their brand and in that time they have gone from strength to strength and have recently expanded into a much larger space. 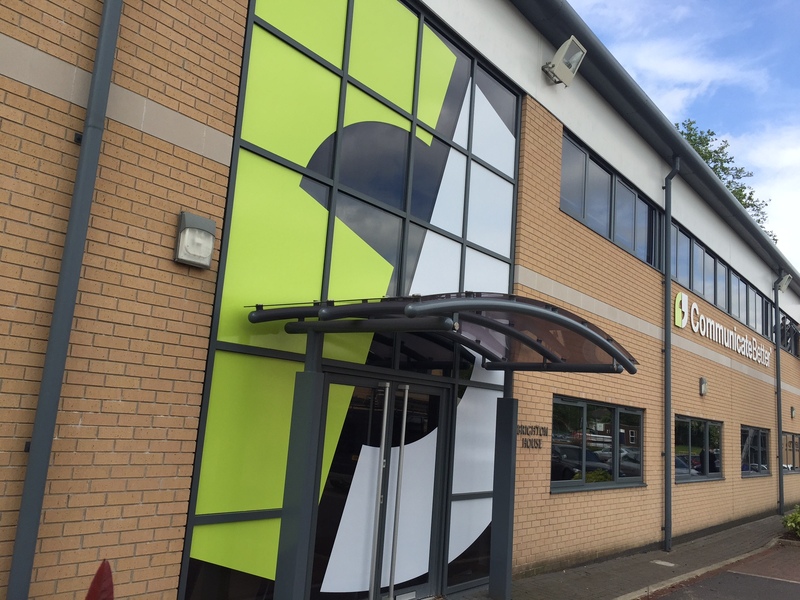 We have designed and installed large scale signage and window vinyls across the brand new office building. Communicate Better’s logo consists of two bright green speech marks, so when we were asked to develop the brand further, we created a cast of colourful, friendly characters using the speech mark as faces. The characters inhabit their own bright, tech savvy world made up of urban skylines and colourful clouds. It was important that their friendly, customer focused branding was applied across the new building as they take the next step in their expansion. Their logo and company name was applied to the outside of the building. The speech mark aspect of their logo was enlarged onto vinyl and stuck onto the glass windows at the entrance. The result is a dynamic graphic which can’t be missed as visitors approach the building. 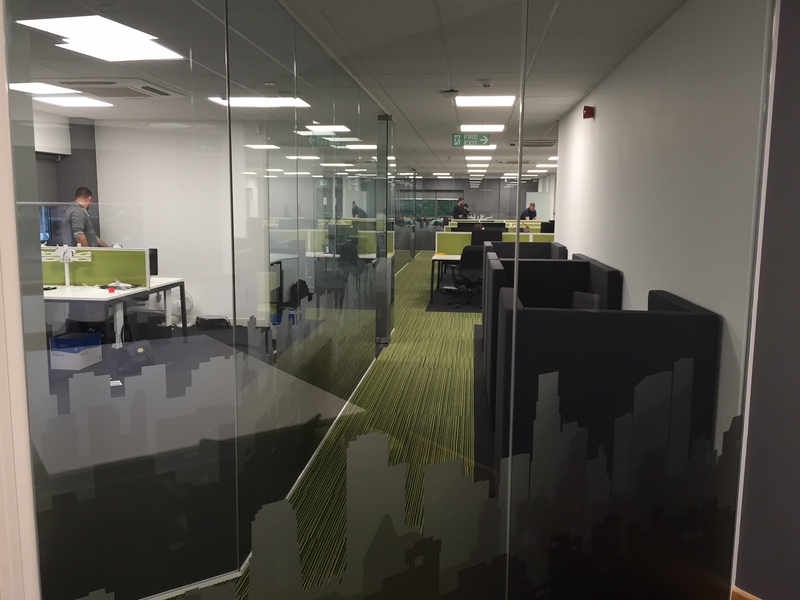 Inside the building, glass walls split up the working areas and these have had a skyline graphic applied across them, adding interest and providing privacy while still allowing light to filter through. Getting the graphics consistent across the glass panels was a technical design challenge which needed some accurate measurements and careful planning! The logo has been applied to various walls within the building and a bespoke typographic vinyl made up of words describing Communicate Better’s service and philosophy has been applied to the stairwell, making a vibrant impact. Finally, every staff member has had a customised illustrated mug, featuring the characters and their name – adding a fun element to the staff kitchen. This has been an interesting and rewarding project for Whale; helping a company we’ve seen grow steadily over the last few years, apply their branding across their new premises. We wish them every success for the future.